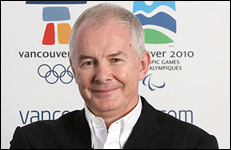 John Furlong was the CEO of the Vancouver Organizing Committee for the 2010 Olympic and Paralympic Winter Games. When Furlong arrived in Canada more than thirty five years ago from Ireland, a customs officer offered him a warm but specific greeting: “Welcome to Canada - make us better.” Furlong took those inspired words to heart and within days he was making a contribution in the community, doing what he felt we should all do – giving a little. Prior to his appointment at VANOC in 2004, Furlong was the President and Chief Operating Officer for the Vancouver 2010 Bid. In his role, he became the Bid’s international face and key spokesperson, tirelessly clocking more than 1.2 million miles in his travels to promote Vancouver’s Candidacy. Furlong has been involved with athletics all his life, having competed at the international level in basketball, European handball and squash. He became Canadian Squash Champion in 1986. Furlong has been a long time member of the Canadian Olympic Committee and has led many high profile sport organizations in Canada. In 2009, Furlong was named Canada’s Most Influential Sport Figure by both the Globe and Mail and the Canadian Broadcasting Corporation and listed #1 on Vancouver Magazine’s Vancouver Power 50 2009 list. Around the Rings Magazine has listed Furlong as one of the world’s top five most influential Olympic Officials in both 2009 and 2010. Most recently, he was named Sport BC’s Sportsman of the Decade. He has in 2010 received Honorary Doctorate Degrees in Law (two) and Technology (one) from the University of British Columbia, The Justice Institute of British Columbia, and the British Columbia Institute of Technology. Furlong’s service to sport has landed him with numerous other forms of recognition - among them The International Olympic Committee’s Olympic Order and the International Paralympic Committee’s Paralympic Order. In 2003, he was named Executive of the Year by both Sports Media Canada and the Vancouver Executive Association for his contributions to the Vancouver 2010 Bid and in 2010, elected as a Fellow of the BC Chamber of Commerce. John was acclaimed as the 2004 Canadian Sport Awards’ Sport Leadership Winner for his service to sport in Canada over a lifetime. He has won Vancouver’s most prestigious tourism award for the promotion of Vancouver around the world and was inducted into the BC Sports Hall of Fame as the 2004 W.A.C. Bennett Award winner. Born in Tipperary, Ireland, Furlong has five children and ten grandchildren.